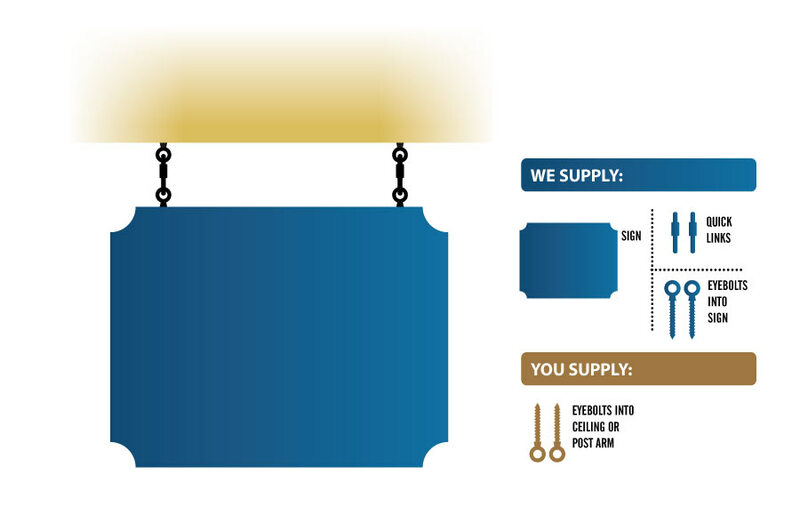 We supply no hanging hardware at all. Choose this if you have everything you need, and do not want anything but the sign panel. 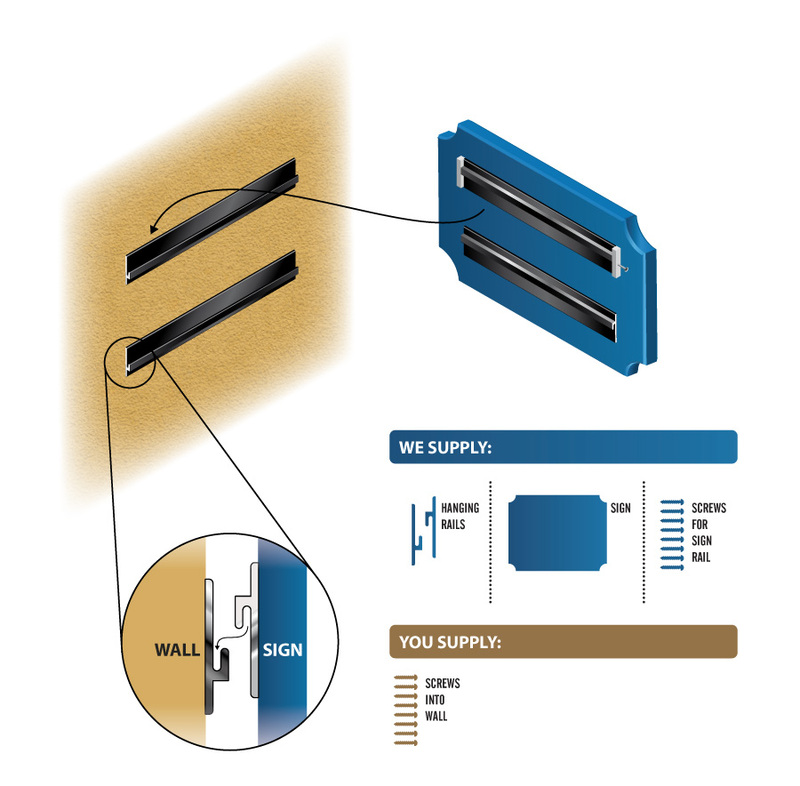 We supply two eye bolts inserted into the top edge of the sign, and matching quick links to connect these eye bolts to appropriate hardware at the site you choose. If you need the eye bolts on the sign to be spaced a specific distance apart, let us know. 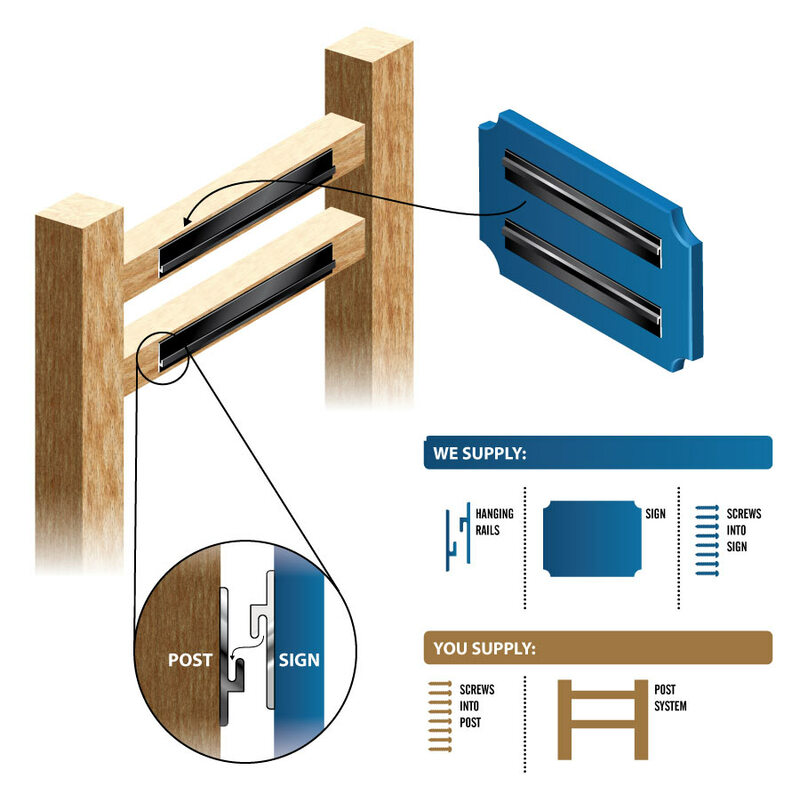 You supply two eye bolts or other fasteners substantial enough to securely attach your sign to your chosen hanging location in local wind conditions. We supply two aluminum angles to attach to the back of the sign with stainless steel screws. These will not be screwed to the sign, so that you can space them correctly based on the size of your post. 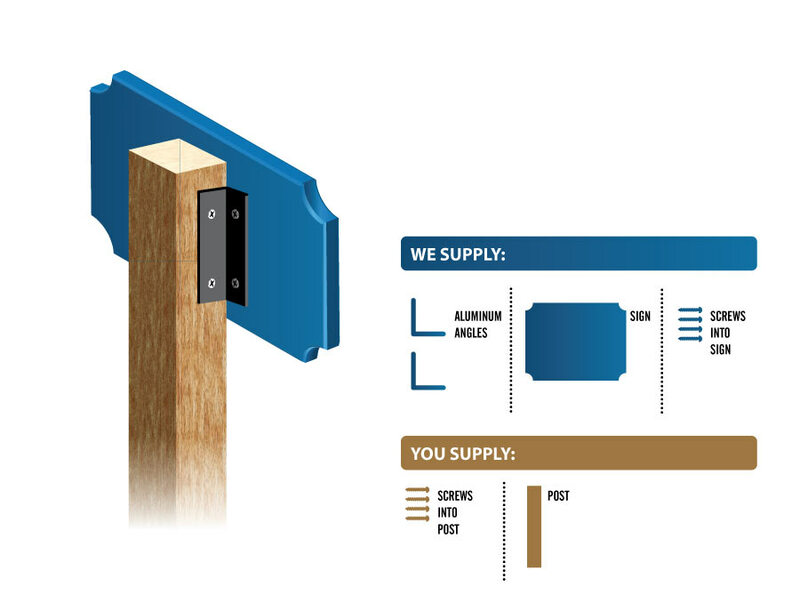 You supply the post and appropriate fasteners to attach the angles to the post. We supply a “wrought iron” style of scroll fabricated out of rust-proof aluminum and powder-coated black. The correct size will be selected by Danthonia based on the size of your sign. This hanging system comes with quick links and, if needed, a short section of chain to attach your sign to the scroll. Scroll hanging systems are not available for signs wider than 32", if your sign is too large for a scroll hanger, you will not be able to select this option when ordering. You supply bolt fasteners substantial enough to securely attach the scroll hanger to your post or wall in local wind conditions. 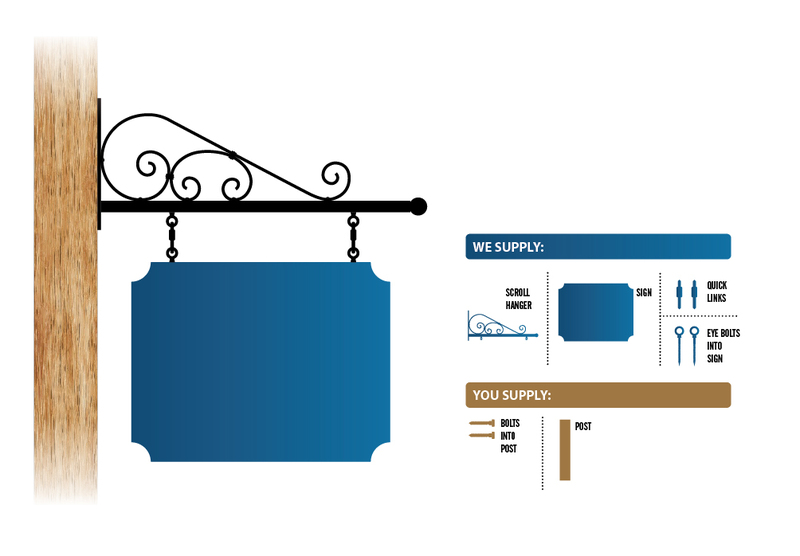 For more information about our scroll hangers, see our Wrought Iron Hangers page. We supply Danthonia’s wall hanging system attached to the back of the sign with stainless steel screws. This system consists of interlocking aluminum rails, one side of which is attached to the sign, the other to the wall. The number and length of rails supplied will vary depending on the size of sign. You supply appropriate fasteners to securely attach the rails to the wall. We supply Danthonia’s post hanging system attached to the back of the sign with stainless steel screws. This system consists of interlocking aluminum rails, one side of which is attached to the sign, the other to the cross members of your posts. The number and length of rails supplied will vary depending on the size of sign. You supply the posts with cross members and screws substantial enough to securely hold the rails and signage to the cross members. The selection of hardware to attach to your wall or post must be made after considering the material your wall or post is made of, the size of the sign, the wind loads in your area, and local regulations. We are unable to do this for you. CONSULT A LOCAL PROFESSIONAL for assistance. Make sure your sign is installed safely.